My book is now available on Amazon.com (click here) if you live in the US or Amazon.co.uk (click here) if you live in the UK. Trade Me will be the cheapest purchase option for New Zealanders (click here) Please be very quick as I'm selling out of my last two cheaper books on Trade Me. "The Sebastopol was a fine clipper ship that made two voyages from London, England to Lyttelton, New Zealand loaded with immigrants for the Provincial Government. From Chinese passengers staging a mutiny, to the suicide of a ship's surgeon, the Sebastopol has an interesting past. Extensive research has uncovered the ship's final demise after leaving New Zealand in 1863, which ended its short career. Includes summaries of both journeys to New Zealand, what happened after the journeys to some of the passengers and crew and includes passenger biographies. 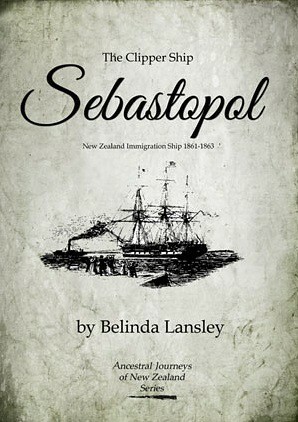 A great read for those who have ancestors on the ship or people with a love of New Zealand history! This book has referenced 115 different sources and has a lot of good information! Please buy it so I can get my next ship book published!! Thanks to Strawberry Mouse Designs for the lovely book cover!